Mailshake is paid for by your team. Individuals can belong to as many teams as they like, but belonging to a team costs the team $29 per person. Each user of a team costs $29 per month (or $259 annually). With each user, your team is allowed to connect an additional mail account. So when you upgrade the number of users on your team to 5, you're allowed to have up to 5 teammates (including yourself) and up to 5 connected mail accounts. The date that your subscription started is the date of the month you will be billed continually. So if you signed up on June 8th, you'll be billed each month on the 8th (starting immediately, on June 8th). If you switch between a yearly and a monthly plan, your recurring date will be updated to the day you made that change. Does Mailshake charge ahead or behind? If you sign up on April 1st, your credit card will be charged on April 1st for your use of Mailshake through April 30th. When you upgrade your plan (either by moving to a more expensive plan, increasing users, etc. ), you will be charged a prorated amount. You will get to preview these charges before completing your upgrade and when you do, these one-time charges will be collected immediately. When you downgrade your subscription, you may end up with a credit on your account. Say you paid for 5 users and then downgraded to 1 partway through the month. For our example we'll say this prorating event gives you a credit of $45 on your account. You are not refunded this amount, but your Mailshake charges in the coming months will take from this balance before charging your account again. Here are the steps to cancel your team's subscription. When you cancel a subscription, you tell Mailshake to stop billing you. 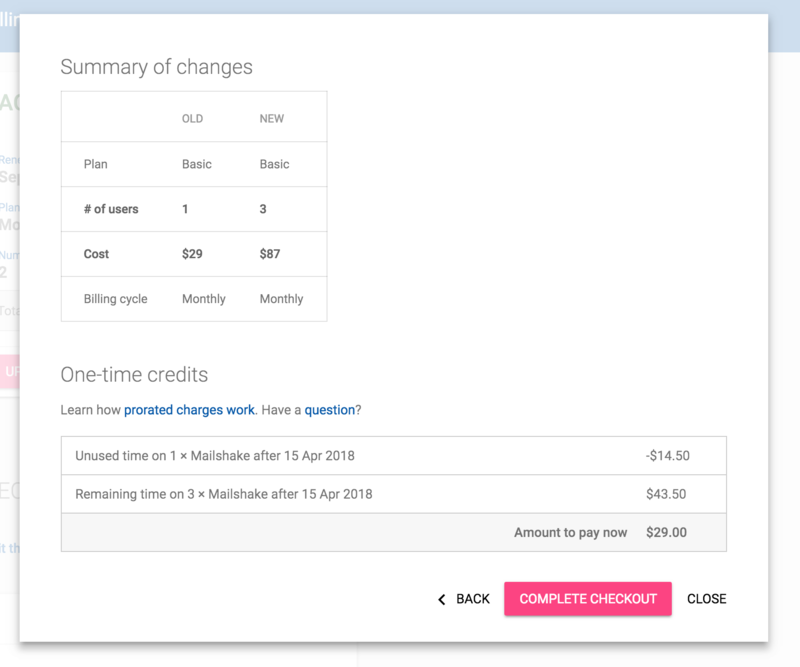 You've already paid for the full billing cycle, so you'll be able to continue using Mailshake until the day your subscription ends. So if your billing cycle starts on June 8th, you have until July 7th to cancel without being charged for July 8th's billing cycle. All of your campaign data is deleted 30 days after your subscription expires. If you'd like to hang on to your data, consider "hibernating" instead. Here are the steps to hibernate your team's subscription. Hibernating stops your billing just like cancelling does, but we will automatically resume your subscription after the time period you select and we do not delete your campaign data. Mailshake only provides refunds for our 30-day money-back guarantee. These are refunds that are requested within 30 days of your team's signup date and only apply to the initial charge.